Entries to the Asylum; Monday 22nd - Saturday 27th May 2017. - Oldboy Plain Archive Limited Edition Slipbox [Bluray]. - The Fifth Element Project Pop Art Steelbook [Bluray]. - Kingsman: The Secret Service FilmArena Full Slip [Bluray]. - Drive Novamedia Lenti Slip [Bluray]. - Frank Plain Archive Lenti Slip [Bluray]. - #000 Drive MondoXSteelbook [Bluray]. - #001 Looper MondoXSteelbook Variant [Bluray]. - #002 Boyhood MondoXSteelbook Variant [Bluray]. - #003 First Blood MondoXSteelbook [Bluray]. - #004 Pan's Labyrinth MondoXSteelbook [Bluray]. - #005 Dredd 3D MondoXSteelbook [Bluray]. - #006 Flash Gordon MondoXSteelbook [Bluray]. - #007 Shaun of the Dead MondoXSteelbook [Bluray]. - #008 The Thing MondoXSteelbook [Bluray]. - #009 Terminator 2: Judgment Day MondoXSteelbook [Bluray]. - #009 Terminator 2: Judgment Day MondoXSteelbook Variant [Bluray]. - #010 Ex Machina MondoXSteelbook [Bluray]. - #013 Reservoir Dogs MondoXSteelbook [Bluray]. - #014 Highlander MondoXSteelbook [Bluray]. - Raising Cain w/ Slipcover [Bluray]. - Evil Ed Limited Edition [Bluray]. - Wolf Guy Special Edition [Bluray]. Asylum Reviews: Injustice 2 [Xbox One]. So we recently got Injustice 2 for Xbox One to review, and it has been every bit as fantastic as we'd hoped. After Injustice: Gods Among Us being a success, we were really looking forward to the second installment, and boy, did it deliver! Utilizing everything that made the first game great, and adding to it with new mechanics - such as the loot drops which unlock new Gear for you to equip on the wide selection of characters on the roster - 29 in total as of launch - just makes this game so much more awesome. The characters are diverse and very well animated for the most part, and the Gear just adds to the enjoyment as you can customise your fighters how you please. Sadly, The Joker is a little too Leto-esque for my tastes (Ledger ftw). For every battle you play, regardless of if you get annihilated, or completely dominate the opponent, you'll unlock some more Gear, which is broken into five sections: head/cape, torso, gauntlets, greaves and accessories. There are tonnes of things to unlock, so you might not always get the things you want very easily, but it sure is fun to try and certainly adds a whole lot of content into the game in terms of replayability, as you'll be grinding away to get some of the items that you want but just won't drop. The online multiplayer is great too, and the Gear unlocks don't throw the game the way that some other game's loot does. And if you prefer, you can disable custom equipped gear so that neither player has gear on show. The environments are gorgeous too, using the same multi-level style as the first game, where you can be bashed through a wall/floor/etc into another area; something which is still as enjoyable as before. It's a great fighting game, and feels truly fluid and entertaining right the way through. Overall, we'd have to rate Injustice 2 a solid 9/10. 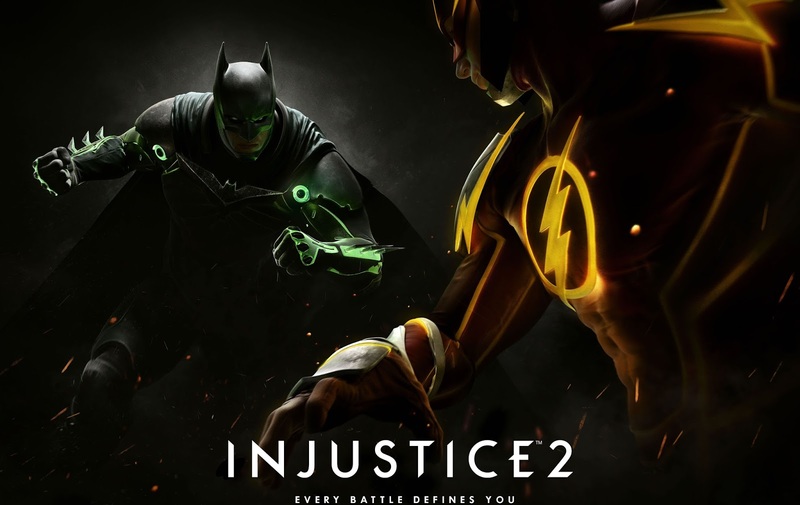 Have you played Injustice 2? What did you think of it? Entries to the Asylum: Thursday 13th April 2017 - Thursday 18th May 2017. Once again, it's been a while since I've done a post on here. So here is (hopefully) all of my recent arrivals, and coming soon you'll have some pics added to this post as well as a few reviews: Dreamfall Chapters, Little Nightmares and Injustice 2! - Phantasm 1-5 Collector's Edition [Bluray]. - Deformers Collector's Edition [Xbox One]. - My Hero Academia Season 1 Limited Edition [Bluray][US]. - Wishmaster Limited Collector's Edition [Bluray]. - Mission Impossible 2 Steelbook [Bluray]. - Oddworld Scarab and Paramite Bracelet Set. - Pieces Deluxe Edition [Bluray]. - Prey Special Edition [Xbox One]. - Nightcrawler Novamedia Lenti Slip [Bluray]. - Dredd Novamedia Lenti Slip [Bluray]. - Cabin in the Woods w/ Slipcover [Bluray]. - The Boy and the Beast Special Edition [Bluray]. - Phenomena Special Edition [Bluray]. - Brain Damage w/ Slipcover [Bluray]. - Little Nightmares Six Edition [Xbox One]. - Indie Box Super Meat Boy Card. - Brain Damage Bonus Pin. - April 2017 Indie Box Super Meat Boy Collector's Edition [PC/Steam]. - One Punch Man Season 1 Collector's Edition [Bluray]. - My Hero Academia Season 1 Limited Edition [Bluray][UK]. - Injustice 2 Promo Copy [Xbox One]. - Psychonauts Vinyl Soundtrack [PAX Exclusive Brain Splatter Variant]. - Ape Escape + Dualshock Bundle Pack [PlayStation]. - Jak and Daxter: The Precursor Legacy Press Kit [PlayStation 2]. - Motel Hell Special Edition [Bluray]. - Microwave Massacre Special Edition [Bluray]. - The Incredible Melting Man Special Edition [Bluray]. - Rabid Special Edition [Bluray]. - S.H. Figuarts Perfect Cell Premium Color Edition. - S.H. Figuarts Son Gohan Cell Saga Version.